Why Rent Our Silverthorne Townhome? 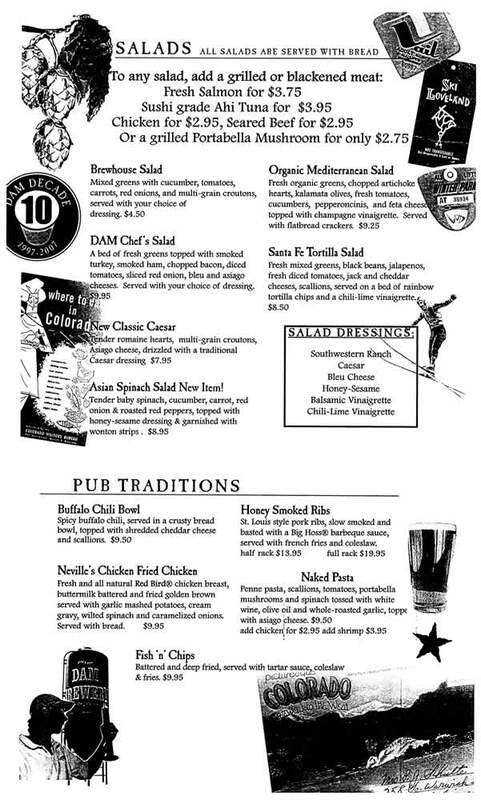 Located only 1.6 miles and less than 5 minutes from our Silverthorne Lodge, the Dillon Dam Brewery is one of the greatest restaurants in Summit County. Outside of the facility is a big green silo that holds hops for the brewing operating that is done right on site. Dillon Dam Brewery draws its name from the Dillon Dam, which is located less than a mile from the restaurant. If you look at the picture to the right, the Dillon Dam can be seen in the upper right corner. Since Dillon and Silverthorne are in the valley, this restaurant is surrounded by the beautiful Rocky Mountains on all four sides. The entrance of Dillon Dam Brewery features double doors that lead to a small reception room where an attendant is waiting to seat you. As with all great restaurants there will more than likely be a sizeable crowd so the attendant will give you a little instrument that lights up when they are ready to seat you. 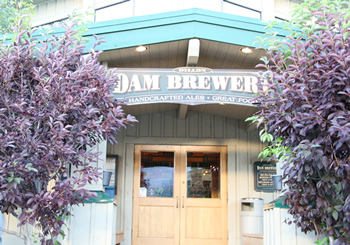 While you are waiting you can take a tour of the brewery that shows the process of how they make beer at Dillon Dam Brewery. There are two levels with the second level having the ability to look over a balcony onto the first. In the center of the first floor is a big bar where people are trying out the freshly brewed beer. There are large screen televisions all around that are playing different programming; some have news, some have sports, others have music videos. The noise level in the restaurant is a light rumble that you might expect from a crowd that is relaxing and enjoying themselves. 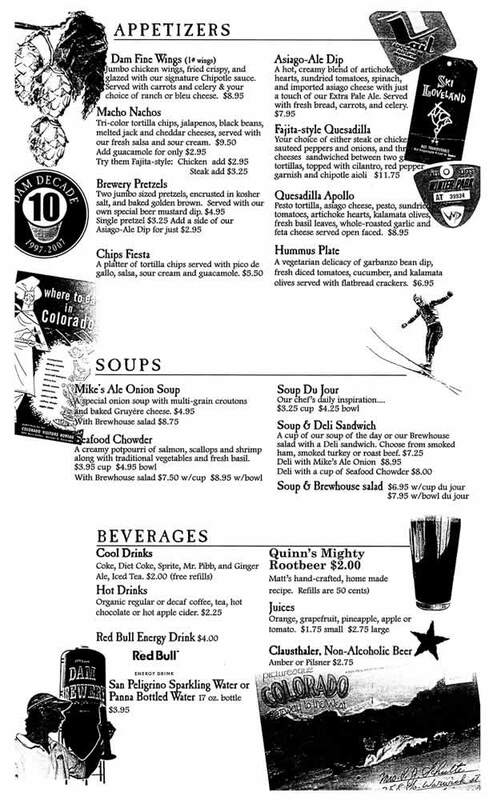 One thing we noticed is that Dillon Dam Brewery has taken a special liking to intentional pun using the word "Dam". 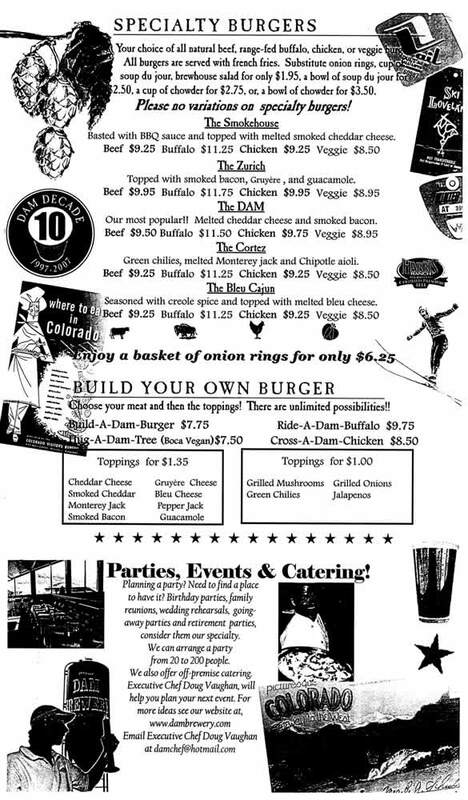 We noticed that many things in the restaurant are described with the word "DAM" like dam beer, dam lager, dam salad, dam burger, dam chicken, etc. They even had a certificate celebrating that they had been in business for a dam decade! ha! In about fifteen minutes the staff was ready to seat us. 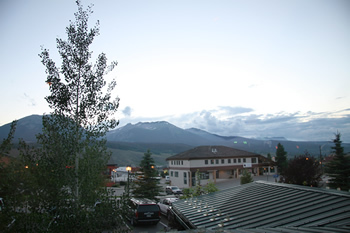 We got a table on the second floor that had a beautiful evening view of the Rocky Mountains behind the town of Dillon. Our waiter was very attentive and concerned with our enjoyable dining experience. 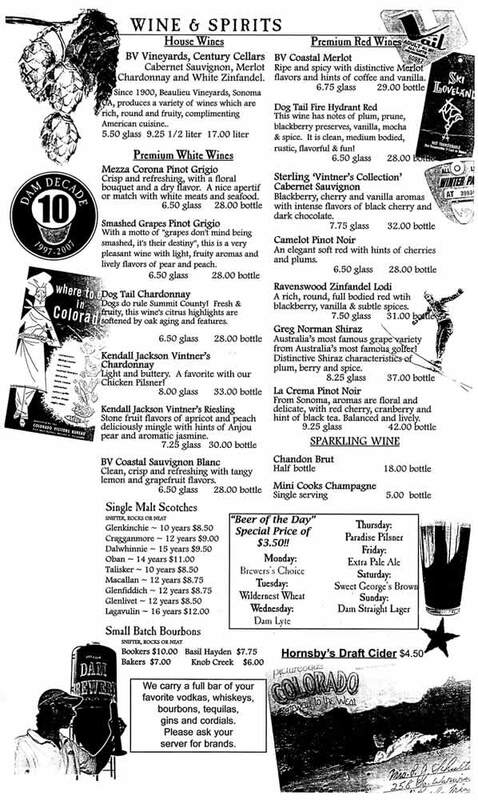 We started off with some Dam Straight Lager from page 1 of the menu below. If you're a fan of thick rich-tasting beer like me then you'll find Dam Straight Lager to be dam-near unbeatable! 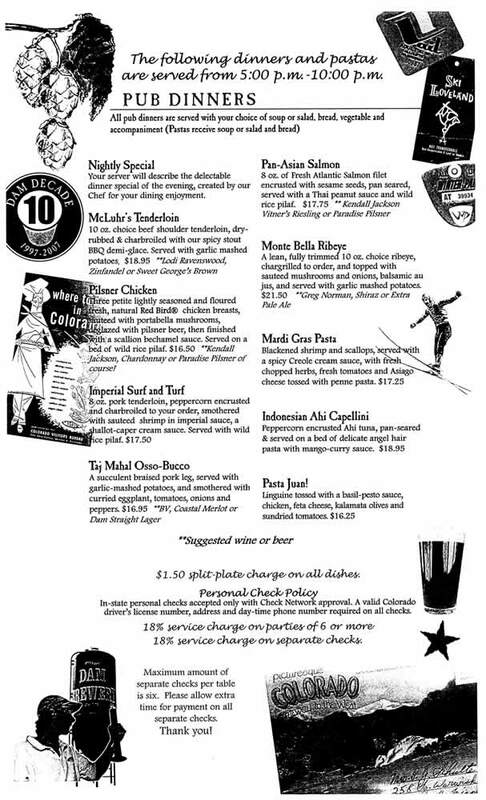 As an appetizer we ordered a Hummus Plate from page 2 of the menu below. 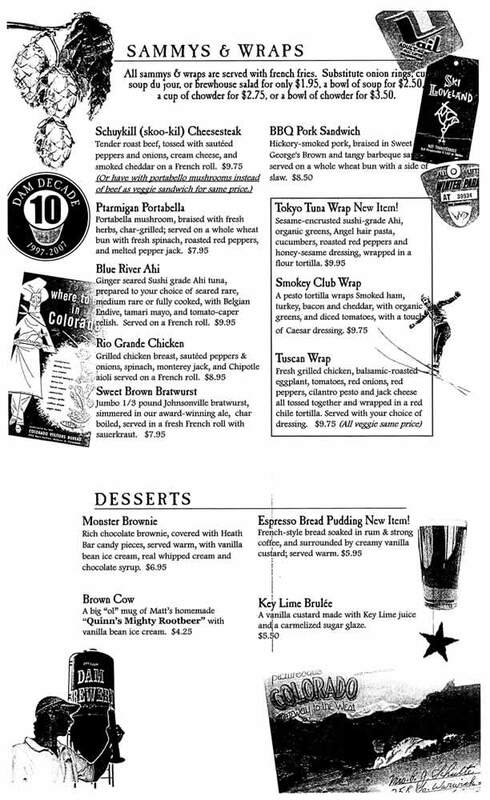 For entrees we had a Schuykill Cheesesteak wrap from page 4 and Mardi Gras pasta from page 6. The kids had macaroni and cheese from the kids menu. Take a look at this great looking Hummus Plate. With a big serving of fresh hummus in the middle, it is surrounded by crackers, tomatoes, olives, and lettuce. We thought we were going to have to fight the kids for our share! The overall experience at Dillon Dam Brewery was great. The food was great, the atmosphere was exciting, the views were pleasing to the eye, and the service was first class. We had a Dam good time! On our way out the door we picked up a menu which is what you see to your right. Click on the small images to view each of the seven pages in full size. 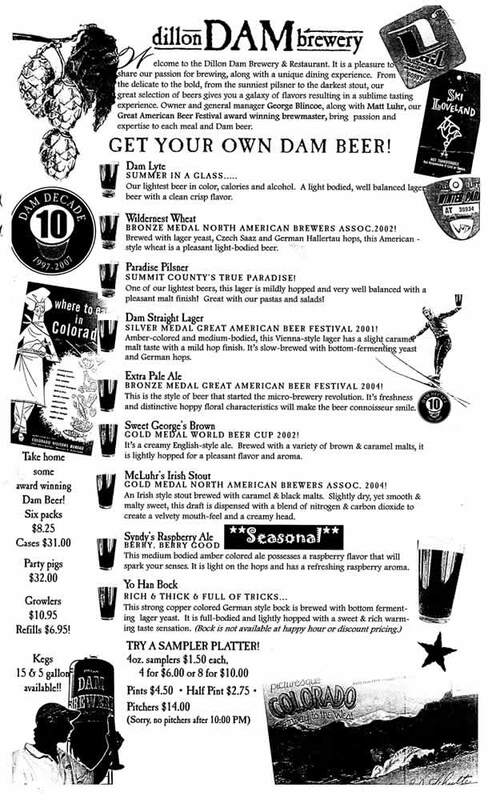 When you visit Dillon Dam Brewery tell them you read this review on SkiSilverthorne.com and that "Dude Dennis" sent you! 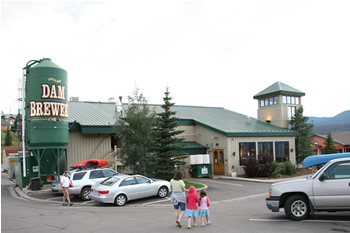 As mentioned earlier, the Dillon Dam Brewery is only 5 minutes from our Silverthorne Lodge. This is just another great reason to stay with us on your next Rocky Mountain Ski Vacation!